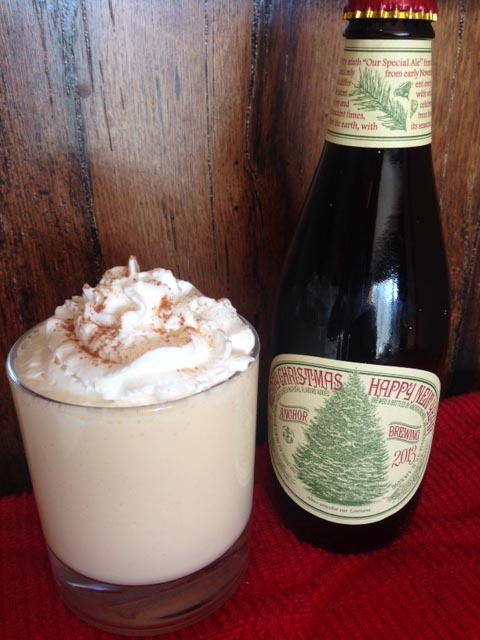 Chef Ryan Scott shares two recipes for holiday favorites made with Anchor Christmas Ale. Happy Holidays! Merry Christmas! How many times have you said those phrases in the past few weeks? In my restaurant, Market & Rye, my staff was more than eager to wish every customer “Happy Holidays” after Thanksgiving was through. But after a few weeks, the reality sets in and you realize it’s ten… eight… three days until Christmas! Not only do you still have to find that perfect gift for your loved ones, but you also need to figure out what you are cooking for the slew of family about to invade your house. My family gathers at a different household each Christmas., and even though the house may change, there are some things that stay constant. I always have fried chicken for Christmas Eve dinner (and a delicious cold drumstick for Christmas morning), and I love me some egg nog. 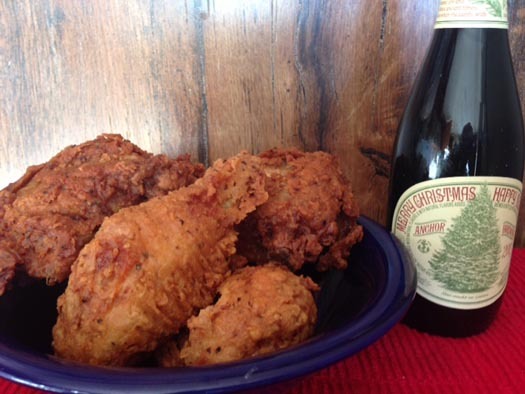 Anchor Brewing always has a very spirited Christmas Ale, and this year I am incorporating it into both beloved dishes for my family – and for you – to enjoy. I want to wish everyone a Merry Christmas and Happy New Year! 1. Dry chicken pieces completely. 2. In a saucepan, place beer and bring to a boil. Reduce by half, about 10 minutes. Cool to room temperature. 3. Place eggs in a bowl with beer reduction and honey and whisk together. 4. In a second bowl, take 1 ½ cups flour and salt and pepper and blend together. 5. In a third bowl, take remaining flour, salt, pepper, paprika, cornstarch and bread crumbs and blend together. 6. Take the chicken pieces and dredge in the first flour mix (flour, salt, pepper only) then the beer & egg mixture and finally in the second flour mixture (with the breadcrumbs). 7. Place coated chicken pieces in a deep fryer on a pan with oil heated to 365 degrees. 8. Fry until golden brown. If internal temperature has not reached 165 degrees, place in a 350 degree oven to finish cooking. 9. Dry on a paper towel. Serve hot or cold the next morning. Who doesn’t love cold fried chicken? 1. Separate the egg whites and yolks. In a mixer, on low, beat sugar into the yolks until smooth. 2. Keep the mixer on and slowly add buttermilk, cream, beer, brandy and spices. 3. Beat egg whites until soft peaks form and fold into the egg cream mixture.